Cooking in someone else's kitchen: Wood. Pecked. 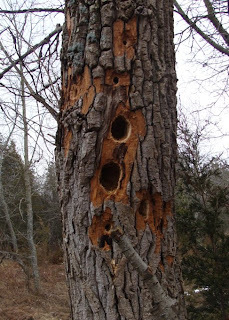 Something has been busy on this half-dead poplar tree. I just discovered that many woodpeckers have feathered nostrils to filter out the sawdust they produce while they are hammering. * Also, the tongue of the Hairy Woodpecker is four times longer than its beak (the tongue rolls up like a tape measure). *I was going to make an observation about nose-hair here, but decided that it would have been in poor taste.